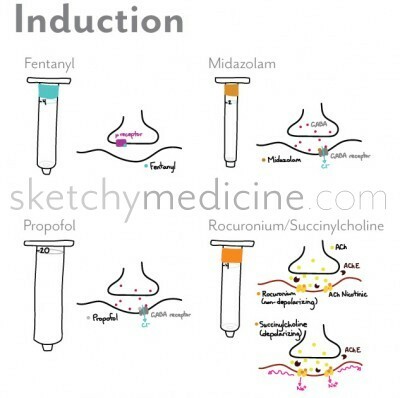 In North America, many physicians like to use a combination of an analgesic and a sedative followed by the induction agent propofol. Sometimes other agents are used for induction such as etomidate or ketamine, particularly if there is a worry about hemodynamic instability as propofol not uncommonly can cause bradycardia and/or hypotension. If the patient is going to be intubated, a paralytic (muscle relaxant) is also used to relax the vocal cords to prevent unnecessary trauma as the tube is passed through them. Competitive acetyl choline (ACh) receptor antagonists such as rocuronium or succinylcholine are used for this. 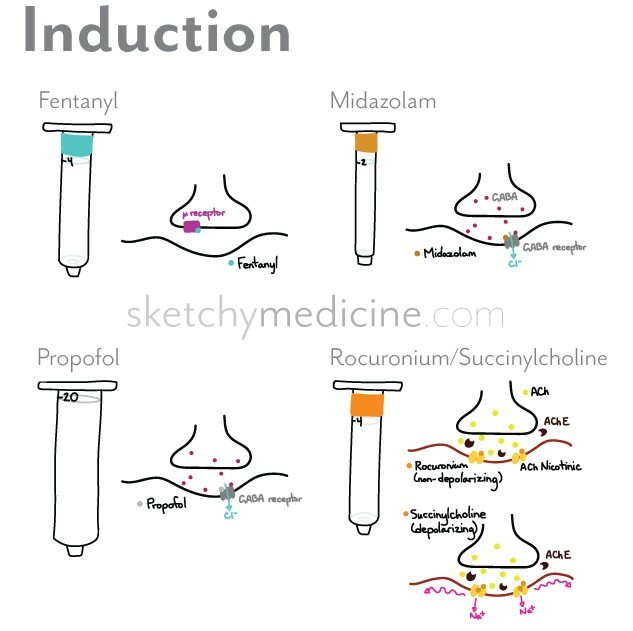 The main difference between the two is that succinylcholine is a depolarizing agent – meaning that when it first binds to the ACh receptor, it causes a contraction, whereas rocuronium is non-depolarizing – so when it binds nothing happens. So with this pesky contraction thing why would any one choose succinylcholine? The nice thing is that the half-life is much much shorter than rocuronium, so if things don’t work out quite the way you want them to, or you just want something fast, you don’t need to continue to help the patient breath. This entry was posted in Anesthesia, Drugs and tagged Anesthesia, pharmacology by Ali. Bookmark the permalink. Such a cute and simple way to present complex topics. Hi Christie, the website was having server issues last week. Please let me know if it has resolved for you now! Dr. Rakesh, Assistant Professor, Andhra Medical College, Visakhapatnam, INDIA. Wow fantastic. Such a beautiful way of explanation. I like it.